A project created from Nature that has become a part of genuine Mediterranean hospitality in the North of Sardinia. A holiday by the sea with Delphina that has an eco-friendly soul. Passion for the environment can be seen in little everyday gestures but also in responsible and far-sighted choices that tell the story of 25 years of Delphina hotels & resorts, our collection of 4 and 5 star structures facing the North Sardinia sea in Gallura between the Costa Smeralda, the La Maddalena Archipelago and the Golfo dell’Asinara. New for 2017 is the use of 100% green energy from renewable sources for the head offices in Palau as well as all the hotels, residences and villas. This energy is certified by a Guarantee of Origin (GdO) issued by the Electricity Service Provider. Nature has always been at the heart of our projects, not just as a source of inspiration, but also a resource to be protected in order to offer holidays where people can discover the authentic Sardinia and enjoy a sense of freedom in contact with our unique nature. This is the essence of the “We are green” brand, created and registered by Delphina to represent our commitment to the environment. A collection of good practices and territorial enhancement initiatives that follow a route aimed at a sustainable future for the land we love. 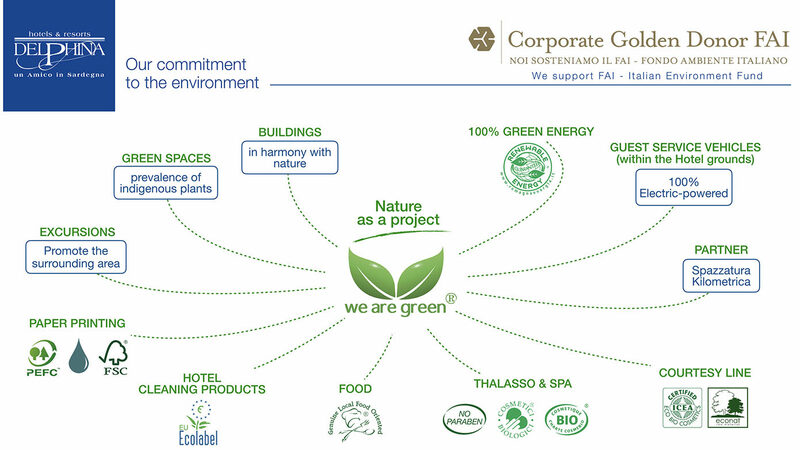 100% green energy from renewable sources to power the 12 hotels, 2 residences, 6 SPAs, 23 villas and main offices in Palau. This type of energy supply means a saving of 3,536 tons of CO2 every year, an amount that would need around 25,000 trees to absorb it. The use of indigenous plants and trees in the creation of natural green areas since they are best suited to the surroundings and require less water. Buildings in harmony with nature that use local materials and which have a reduced visual impact. Environmental sustainability: Eco/bio and paraben-free courtesy products in rooms and SPAs that are most suitable for sensitive, intolerant and allergy-susceptible skin types. Ecolabel products for regular cleaning in hotels and resorts and separated waste collection management. Electric service vehicles for transporting guests around structures. Genuine Local Food Oriented®, the Delphina quality brand that supports healthy, correct high quality nutrition through the use of genuine local ingredients that are preferably 0 kms and which vary according to the season. Organic vegetable garden and aviary at the Resort & SPA Le Dune, an educational experience dedicated to our youngest guests so that they can develop a love of nature through discovering the development of Mediterranean plants from seed to fruit, culminating in picking and harvesting fruit and vegetables and collecting eggs laid by our free-range hens. Excursions aimed at promoting the region and the cultural excellence found in Gallura. Development and support for local handicrafts and the economy of the inland area’s small communities, together with their rich histories of traditions that have remained unchanged for thousands of years. Eco-friendly paper certified by the FSC (Forest Stewardship Council) or PEFC (Program for Endorsement of Forest Certification Schemes) and the use of mineral oil-free inks for printing publications and catalogues. Partnership: Corporate Golden Donor supporting the FAI (Italian National Trust) in the protection and safeguarding of Italy’s cultural and natural heritage and a partner of Spazzatura Kilometrica, the competition aimed at separated waste collection organized by Max Laudadio (Striscia La Notizia). Be green along with us. So join the “We are Green” movement and save CO2 on holiday! 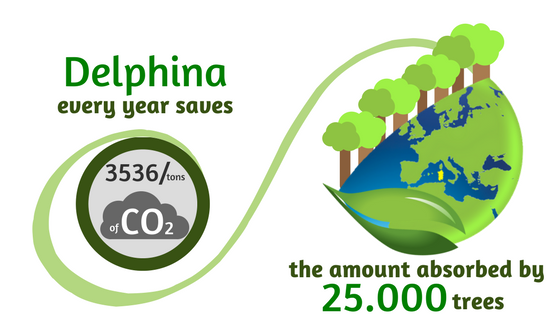 We have always known how important it is to contribute to the conservation of Nature which is a fundamental ally for us and an example of added value for Delphina hotels & resorts. But every gesture becomes even more valuable when people who are enthusiastic about Sardinia like yourselves choose Delphina in order to enjoy an authentic experience that respects the environment and enhances the culture found here in Gallura. Spend your environmentally friendly holiday in Sardinia and strengthen our and your daily commitment to the environment with the #wearegreen agreement.